I took this picture of the peak of Mt. 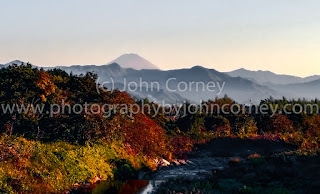 Fuji from northern Yamanashi prefecture, which is to the north of the famous volcano. Looking south from this vantage point to the mountain, its northern side is going to be in the shadows in the winter months. I took this photo while taking a walk in rural Yamanashi close to sunset in mid-October 2015.